2 Books that Contain the Most Comprehensive Commentary on Digital India! Digital Telangana – White Paper! Women today are playing pivotal roles as entrepreneurs, workers, managers; excelling in all fields, be it medical, IT, or architecture. But the statement stands true only for a small section of our society. The larger sections of women in the country are still deprived of basic education, healthcare and equal opportunities. 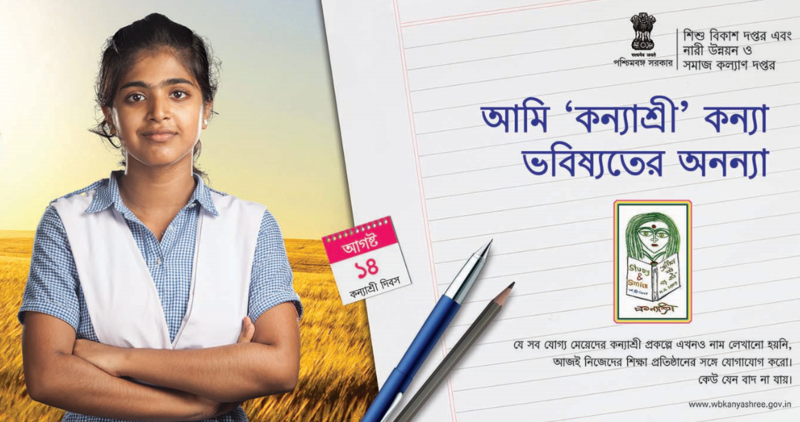 With changing times, it is imperative for a country’s policy makers to sit back and address the issue of educating its womenfolk and more importantly – the girl child. The literacy rate of India in 2011 was 74.04% which is a six-fold improvement from 12% at the end of British rule, but it is still below the world average of 84%. The male literacy rate is 82.14% and whereas the female literacy rate is only 65.46%. The wide gender disparity in the literacy rates in India has prompted the central and several state governments to initiate schemes to bring about a positive change. Governments are trying their best through schemes such as Beti Bachao Beti Padhao that targets survival, protection and education of the girl child. Similarly, to empower the rural women and give them an alternative of cleaner fuel, Pradhan Mantri Ujjwala Yojana (PMUY) was introduced wherein the government provides LPG connections to women from families below the poverty line. The ICDS [Integrated child development services] is another government programme that provides food, preschool education and primary health care to up to 6 years old. The programme combats gender inequality by providing girls same resources as boys. All programmes and schemes are the result of extensive research that lead the policymakers to solving the genuine problems of our society. Kanyashree is one such innovative scheme that has been started by the Department of Women Development and Social Welfare, Government of West Bengal. This scheme helps girls of economically weaker sections in improving their status and well being by educating them. 18 is the legal age of marriage for girls under the Prohibition of Child Marriage Act, 2006 [PCMA]. Despite this, early child marriage continues to be practiced in many parts of the country. Keeping this in the backdrop, this scheme was conceptualized. Conditional cash transfers ensure that girls continue their education up to higher secondary or equivalent in technical and vocational streams. This necessary delay in marriage ensures that the girl reaches the age of 18, the legal age of marriage, and reduces the risk of early pregnancies and related health problems. A total of 38,89,405 girls have enrolled so far (as on 21st of April 2017), a feat that needs to be applauded. Digitization plays a key role in managing, monitoring and keeping an eye on the progress of each child. The challenge lies in reaching out to these target groups and holding on to them for the period specified. The scheme’s web site not only provides updated information, it also provides access to the scheme for the girls that qualify for the scheme. A new Kanyashree APP has also been started to notify young girls on all available recruitment. The government has been able to identify and address the main concern of the poor families. A positive, well thought out approach to an age old practice which has its beliefs firmly rooted in our culture, makes it a sensitive path to tread on. Government’s incentives are tempting and hence all families across different cultures are pausing and giving it a try. By educating a woman, we educate a nation because this awareness then trickles down to the entire family. The baton of change shall effortlessly be passed from one woman to another and a positive change will take place in society that shall lay the foundation for strong women figures as role models to promote social, economical and psychological empowerment. Best of Tech 2019 – 9 eGovernance Predictions by Coeus Age! Gems of Digital North East – Collectively Answering Three Critical Questions! Envisioning A Model Digital State – Getting Back to Basics! We have discovered 41 Gems of Digital India! Budget 2017-18 clearly hinges upon #digital! Introducing the 41 Gems of Digital India! Can DigiLocker Catalyze Digital India? Conceptualizing the Bharatiya Model of Digital Governance!